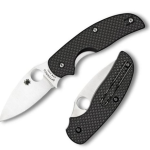 Spyderco, a worldwide leader in pocket knives and folding knives, recently introduced the Dragonfly 2 to their lineup. 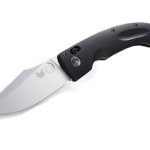 The Dragonfly 2 features some of the strongest steel blades in the knife community and has received extensive praise from knife users since its release. The new Dragonfly 2 is 5.6 inches long when the blade is extended and 3.3 inches long when the blade is retracted. It weighs 1.2 ounces and can be customized with either VG-10, Yasuke Super Blue, or ZDP-189 type steel. Additionally, a signature feature of Spyderco knives allows for ambidextrous use by both left and right handed users and a signature Spyderco thumb hole allows for one-handed opening. Finally, all Spyderco knives come with a limited lifetime warranty to replace any defective parts. Spyderco’s knife designs have been around for close to 20 years. 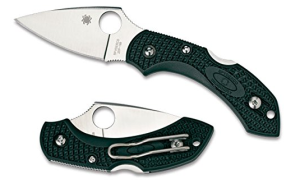 In the latter part of the 1990’s, Spyderco made a change to their design by moving the thumb hole a little farther from the handle, which made the knife slightly larger than before. The decision to move the thumb hole was to increase ergonomic comfort and to improve safety. Only recently have additional design changes been implemented. A wire clip is now standard instead of a molded one and the edges of the handle are slightly angled – both changes helping make the knife more user friendly. Jimping, small grooves added to the top of the blade for easier grip beyond the length of the handle, was recently added to the Dragonfly 2. Although the previous handle on the Dragonfly series was sturdy enough to handle the knife, the addition of jimping has made the knife a “complete package,” as it’s not uncommon while cutting to place an index finger on the top of the knife. Smooth steel made finger-slips more likely and were a potential cause of injury. The DF2 weighs in at just 1.2 ounces. The only noticeable drawback about using the Dragonfly 2 as an EDC is its width. Dragonfly knives have always been a bit wider than their counterparts, making them more noticeable in tight pockets. Fortunately for the newest Dragonfly, its small size and new beveled edges don’t make it any more difficult to pull from the pocket than previous iterations. ZDP-189, a new class of high-quality steel, is the default steel used in the Dragonfly 2 blades. With a carbon content of around 3% and 20% chromium, it’s one of the most durable and stain-resistant blades in an everyday carry knife on the market. 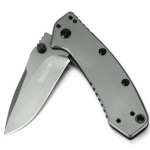 The strength of the ZDP-189 steel makes it a bit more difficult to sharpen than the other popular steel, S30V. Many users of the DF2 have reported being able to still push the knife through a piece of paper well into the knife’s life. Sharpening should be done once every 6 months with regular use, or once every year with light use. While the blade is tougher to sharpen than competitors, its sharpness-retention more than makes up for the hassle. The new blade in the DF2 also angles down more sharply than predecessors. This more acute angle makes the blade safer to hold, as it points farther away from users’ fingers. As mentioned earlier, Yasuke Super Blue steel and VG-10 blade options are also available. The Dragonfly 2 has a convex-style grind and the finish on the steel is beautifully smooth and difficult to tarnish. The edges of the convex grind are slightly beveled and taper gently to the knife’s point. 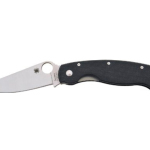 The fiberglass reinforced nylon (FRN) handle on Spyderco knives has received lots of praise from knife users over the years. FRN makes the knife easy to grip and easy to deploy. Newer pivot mechanisms make the deployment action softer and easier, but aren’t so loose that they cause the knife to accidentally deploy in your pocket. Spyderco recently abandoned their molded clips in favor of wire and the consensus among users has been overwhelmingly positive. The wire clip has more flexibility than molded ones and is easier to remove during use. 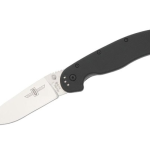 The Spyderco DragonFly 2 is an excellent knife to consider when looking for pocket knives!